The first Radio Gold compilation concentrated on the songs that were being played by the UK's Golden Oldies radio stations and the title selection mirrored the stations' playlists in a tribute to their musical dedication. 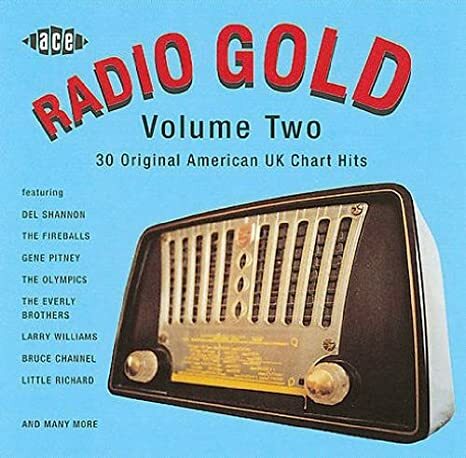 Radio Gold, Volume Two focuses more closely on memorable American recordings that became UK chart hits or that inspired hit covers by UK artists. There are thirty original recordings taken from the golden era of rock 'n' roll (the mid-'50s to the mid-'60s) and they include some of the very best songs of their day - Louie Louie by The Kingsmen, Hippy Hippy Shake by Chan Romero (covered in the UK by The Swinging Blue Jeans), Hey! Baby by Bruce Channel (released on Mercury in 1962, it reached No. 2 and was an influence on a young band called The Beatles) and Let's Dance by Chris Montez. Fab!